Candlelight’s “Hairspray” is an Enthusiastic Delight! Bailey Peyton Walton is a real find, playing the leading role as Tracy Turnblad. Tracy is a Baltimore teenager in the early ’60s whose dream is to be a singer/dancer on a local television station show “Good Morning Baltimore.” Trouble is, while she realizes that she is a terrific singer and dancer, she lacks self confidence, as she is ….. fat! The only “enormous” thing about Walton, playing the role, however, is her incredible talent. She is a delightful marvel, glued to the TV set daily, not wanting to be a problem to her mother, but desperately wanting to be her own person. And she has an enormous crush on the young star of the Baltimore show – Link Larkin. “Good Morning Baltimore” (think an “American Bandstand”)is produced by Velma Von Tussle, a woman approaching middle age, resting on the laurels of fame many years ago when crowned, “Miss Baltimore Crab!” She now wants fame and fortune for her snobby daughter, Amber, a member of the TV show’s cast. Alicia Dunfee and Alisha Winter-Hayes are super as the snobby mother and spoiled daughter! While initially worried that her mother might be angry about her being on television, Tracy is relieved when her mother, Edna, becomes very supportive, as does her father, well-portrayed by Kent Sugg! Edna is a riot, played in a cross-dressing role by Patrick Sawyer! “Hairspray” the musical is based on a John Waters 1988 movie. The original movie included a man playing the mother role, and than gender-bending has continued through the movie to the Broadway musical again as a movie – John Travolta playing the role of Edna. In various incarnations of the show, the mother’s role played by a man has been off-putting to me. My feeling has now changed, as Patrick Sawyer is a sight to behold. He makes no effort to make the role seem quirky – turning the part into a thought-provoking experience! Tracy comes through with a mind of her own, announcing that she is for acceptance of blacks as equals – much to the horror of the television show’s producer! A local demonstration for fairness gets out of hand, resulting with many of the demonstrators on both sides of the issue being put in jail. Racial tolerance now becomes the theme as Tracy and her friends begin to enlighten others, with super dancing and music making the whole idea become more acceptable. 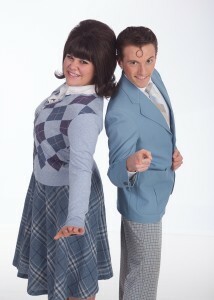 While everything about “Hairspray”is perfection, the star is Bailey Peyton Walton as Tracy Turnblad. She makes if very clear that an incredibly talented person, irregardless of physical size, can become exactly what she wants to be! This is a classy show, looking with great affection on the 1960s when “popularity” was determined by the height of a beehive hairdo, a hickey on a dating girl’s neck, being crowned “Miss Baltimore Crab,” or even becoming a dancer on nation-wide TV! When: To March 8, 2015.